Mother's Day is coming up this weekend and while many people may not have human children, they do have dog children. I know most of you consider your dogs to be your children and hope you are celebrating this weekend with them. Today, I want to share something special I received from For Love of a Dog Jewelry. Last month was Jeffie the Dog's birthday from the Talking Dogs Blog. In honor of his birthday, his mom +Sue Kottwitz held a month-long birthday party with lots of fun games and prizes. 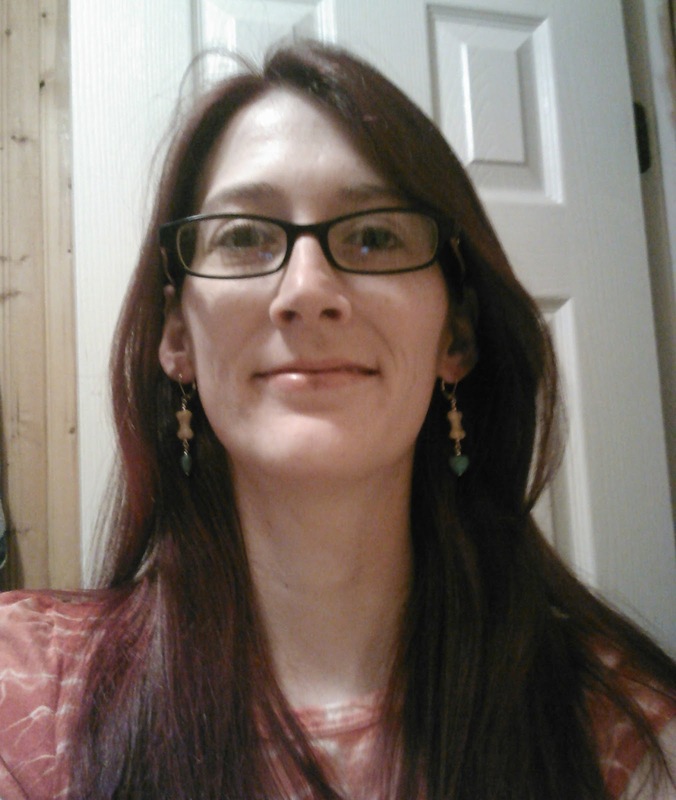 I was lucky enough to win a pair of earrings handmade by Sue. My super cute dog mom earrings! 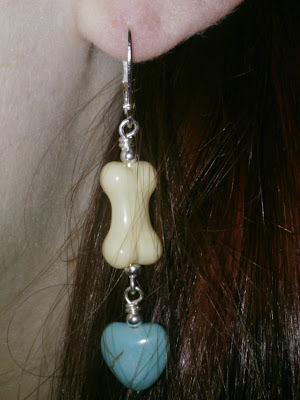 "Handmade for the dog lover in your life or a special friend, these dog bone earrings are pawsome. Chubby turquoise gemstone hearts freely dangle from three dimensional light tan lampwork glass dog bone beads. All hand wire wrapped with silver. Perfect gift for a dog lover friend or for yourself." Dog moms - wouldn't you love to treat yourself to a special gift this Mother's Day? Or maybe you can hint to the dog daddy or your significant other that you think this jewelry is pawsome! "We specialize in handcrafted art jewelry and decorative accessories for dog, cat, and horse lovers. We strive to use only the finest materials: sterling silver, gold, precious and semi-precious gemstones, crystals, glass, vintage and found objects. We take great pride in our work. Be assured that you are purchasing a high quality piece of wearable animal art directly from the designer." Plus, they offer free standard shipping if you're in the US! My earrings are very well made and I would recommend them to others. My daughter, Lily, has even been trying to borrow them from me already! Be sure to stop by For Love of a Dog jewelry and take a look at their selection! I hope you all have a wonderful Mother's Day this weekend, no matter what type of furry, feathery, or scaly child you might have. Disclosure: I was not compensated to share this post. I am also not affiliated with For Love of a Dog Jewelry. 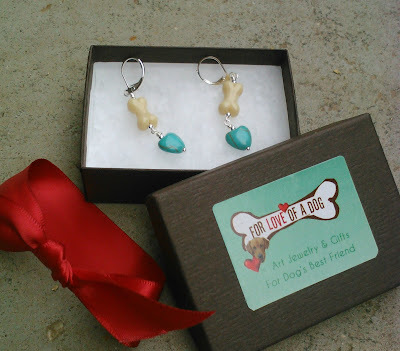 I received a pair of dog bone earrings from For Love of a Dog Jewelry as a prize in a giveaway on another blog and decided to share my thoughts on this product with my readers. All thoughts and opinions expressed here are my own! Congratulations on your fabulous earrings! Mommy loves them and is going to check out the shop. Thanks! Congratulations on winning and what fun earrings. Nice one Ann. Have a terrific Thursday. Wow, what a lovely post :-D I really am delighted that you're enjoying your earrings and now you've made my day with this wonderful unsolicited review! Thank you! SUPER cute! I am heading over to check out all the pretties. Them earrings are great Ann, Sue does some lovely stuff. have a wonderful Thursday !!! You sure won a pretty gift! saweet....way kewl job sue did !!! What a great prize! Congratulations! No problem Gizmo - I was having a problem with my feed and had to change it again, thanks for resubscribing though. :) Shiner has been coming since last week. Something I wanted to do for awhile but don't really have a good excuse for not doing. We'll try to make it Sunday morning! Those are really cute earnings! Those are cute earrings. I like that the "dogness" of them is subtle - people would have to look twice to see the dog bone. I like dog themed jewelry but not when it is obvious and hokey. Glogirly recently won a super cool necklace from For The Love Of Dog. She can't wait to wear it at BlogPaws. ...that is if she can successfully hide it from Waffles. They look beautiful on you! I won the monkey earrings the very first week and I love them!! Oh those were cute - congrats! Those are so pretty! I love them. Turquoise is my fave color. Great prize!